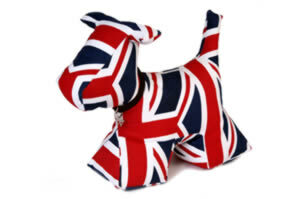 For those who want to buy the famous Union Jack Fabric Dog Doorstop, ‘All Up And On’ are running a sale at the moment on www.allupandon.co.uk and they have reduced the price of the dog door stop by 25%! This fun doorstop made from Union Jack fabric has a brown collar made from real leather, complete with a ‘W’ Wish charm. Designed in the UK and made using only the finest materials, the Dog Doorstop weighs approximately 2kg, and is filled with a man-made fibre. His feet are filled with gravel making him a sturdy and reliable fabric door stopper.